While on a routine toy patrol and following up on a lead from my buddy Colin, author of The Super-Duper Toy Box, I headed over to Hobby Lobby to look at the plexi display boxes Colin picked up to display his loose action figures and to see what other collectibles I might find. 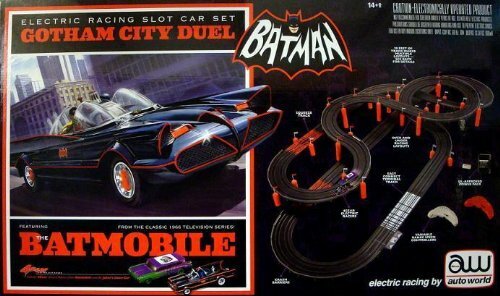 While I was there, I spotted this cool Batman slot car kit and I so want to add it my collection, but with the $150 price tag, it definitely would cut into my monthly toy budget. However, with one of Hobby Lobby's 40 percent off coupons, it would come to about $90, which is an awesome deal for this piece. 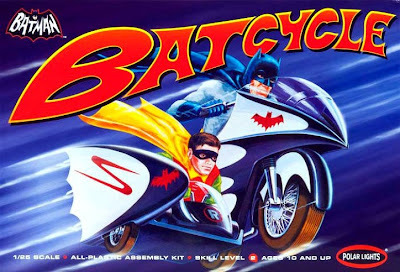 I was also hoping to find a Polar Lights Batcycle. 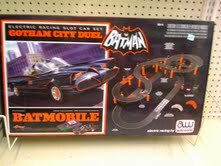 I picked up my Batmobile and Batboat at Hobby Lobby, but I am yet to see the Batcycle for sale there. I could pick one up on eBay for good price, but with shipping the price gets knocked back up and I was hoping to use a 40 percent off coupon like I did with the other two models. I am debating on using last months Adsense profits to pick up the slot car set, but I am also expecting to pick up the John Stewart Green Lantern on the 15th from Matty Collector and I am patrolling my local Toys R Us for the fourth wave of the Retro-Action DC Super Heroes line, which includes: Shazam, Black Adam, Martain Manhunter and Darkseid. So, I am going wait and see if I can pick up these other pieces before diving into the slot car race. Wish me luck on my hunt. That slot car set is soooo sweet, I would love to get that one too, maybe it will be something to add to a Christmas list or something, because my monthly toy budget is stretched as well. ...and have experienced great customer service, and it looks like the Batcycle is on sell, scratch and dent though, if you are going to build it, not bad and maybe that price would help towards shipping. That's a great idea. Maybe I should ask for it for my birthday or Christmas. Thanks for pointing out that model site. There are a couple of Star Wars models I wouldn't mind picking up too.